I just found out that I write a "cheese sandwich" blog. A recent article written by Pete Wells of "Food and Wine" magazine sought to take a look at the world of food blogging. The result is, in my opinion, a strange and lopsided article that misses out on many many aspects of food blogging. Many things about the article bothered me. The way he chose to pick on specific bloggers by quoting their words out of context is just so mean and small-minded. His forceful words "Nobody cares what you ate for lunch" suggests that somehow people who choose to blog about everyday, simple food are inferior to those who choose to write edgy, dramatic food blogs. What do you think? Me, I love my "cheese sandwich" blog. Or shall I say my "dal-chawal" (beans and rice) blog. I shall continue to try and blog about more tasty, nutritious, affordable, accessible, sustainable, wholesome food. Join me for a cheese sandwich! So, what did you have for lunch today? I think that this guy Pete fails to understand that blogging need nto be about somehting special,unusual or unique.It can be a daily routine or not-so-special thing.This applies to any kind of blogging in general,I guess.So who is this Pete?? and isnt his this (crappy)article like a blog entry anyway,he is just pennign down what he thinks,except this will actually be pinted on paper. Ignore this Nupur and keep up the good work. Looks yummy - will definitely try this. Another one of my favorite cheese melts: havarti with herbs, melted on seeded rye bread, with just a tiny sprinkle of paprika and cumin. A light spray of cooking oil helps as well. I like dal chawal. And strangely enough I've never posted about cheese sandwiches till today. Maybe we should invite him to a cook-out and ask him to write about something he actually cooked instead of referring to others. You know it might be true what they say ... "Those who can't do ... criticise." Millions of people struggle with the question daily "What's for dinner/lunch today?". Here we are showcasing our everyday meals, I don't know how anyone can put down that concept. Only people who don't have to cook for themselves and for others, feel that way about everyday food. But I like that you stand up for yourself! I see this as trying to get "traction" for his own snarky article off the blogging efforts of others. For me, it's all about the writing - and a cheese sandwich blog (or a dal chawal blog) suits me to a T if I enjoy reading it. And yours is one of the best. pete Wills isn't speaking for me. 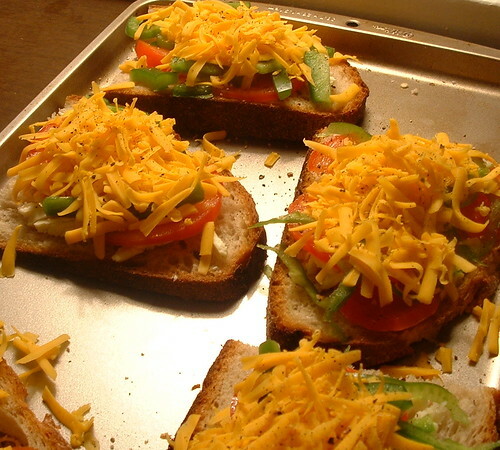 Cheese sandwiches looks great,Nupur.I love cheese sandwiches and of course my 'rice and dal' too. As Supriya rightly said Mr.Pete fails to understand the concept of a "blog". Its a binary log of our daily events, personal, social anything and everything, its for family friends and everyone who enjoys reading it. Its lot of fun and some of them are so informative and realistic . 'Dal Chawal' or 'Cheese Sandwich' Blog..it doesnt matter what we call it as long as we enjoy doing what we do i.e bringing forth our everyday food to family,friends and readers all over the world in an honest and sincere manner without causing hurt or harm to anyone. Who cares what Pete Wells thinks? I don't care about congealed Pig's blood jello or some such yuck-inducing, albeit dramatic stuff. Soaked some val beans to try out your Dalimbay bhat this weekend - and learned how to sprout lentils/beans from your blog too! Glad especially for your Marathi food series and the Indo Chinese fare. Gives me something different, and nutritious to try! Nice looking cheese sandwich there.I love all the 'Dal Chawal' or 'Cheese Sandwich' blogs out there. Each post is not just a mundane recipe or what I had for dinner line, but a story in itself. I enjoy reading all about it. Each one is unique and gives me new ideas on what I can serve for my family. Lord Krishna said to Arjuna, "Arjuna! Food is the chief formative force. The soiled mind dulls the brilliance of moral excellence; how can a muddy lake reflect clearly? The divine cannot be reflected in the wicked or vicious mind. Food makes man strong in body; the body is intimately connected with the mind. Strength of mind depends upon strength of body too. Moral conduct, good habits, spiritual effort - all depend upon the quality of the food; diseases, mental weakness, spiritual slackness - all are produced by faulty food"
Sathvik food has been given so much importance in the vedas and ancient scriptures. Millions of women in India cook 3 or more meals every single day for their families, most of the times from scratch, to ensure that the family is well nourished. It's an art or rather, highest penance! A person who doesn't care what he eats for lunch or thinks it low to blog about everyday meals which are cooked with great care, love and patience, cannot begin to imagine the joy of the many simple and wholesome meals which you and a great many people blog about. In my opinion, his post is not worth wasting a minute. I care about what i eat for lunch and i'm glad that you blog about everyday meals rather than some oh-i-can-brag-about-this delicacy or an exotic dish. Annam Parabrahma Swaroopam- Food is a form of Brahma. Wholesome food is all the more HE. Nupur - Your cheese sandwiches look sooooo tasty! There's nothing quite as comforting as a great cheese sandwich and a bowl of tomato soup. Mmm, mmm, good! Nupur, your sandwiches look delectable. And I absolutely love your "dal-chawal" blog. Hail to all the wonderful "cheese-sandwich" food blogs out there. I have become a fan of your blog in one day!! P.S:- For this cheese sandwitch, whats the baking time and temperature?? Also I am not big time on Cheddar, can mozerella be used instead?? dear nupur, 'ruchira' a humble cook book written by a simple housewife about everyday cooking including dishes like varan bhat, is today .....hold yr breath....the only book to have crossed 1.5 lac mark of sold copies , racing ahead of renowned works of literature like 'shyamchi aai ' and 'gad aala pun simha gela' which are the only works to have sold more than 1 lac copies. this simple housewife , having written her mundane everyday food cook bk , was rather anxious when she approached the v prestigious publishing house , kirloskar prakashan for publishing her 'tachan vaja hastlikhit'[notes like manuscript]. but it is the grtness of the kirloskars with their business acumen, who foresaw the grtness of this v humble bk.......and the rest is history. i have to also tell you , whenever i ask an english bk store , if they have any marathi bks, i get the same old answer, no except for ruchira.this shows its popularity and demand. so dont lose heart and keep up the wonderful work that you are doing. as far as mr . wells is concerned , well, he may just as jump in a well ! p.s. all,s well that has begun and going on well. Well said, Nupur. I like reading your blog--and I learn much from it. Sandhya--that was very beautifully said. I agree--that what we eat every day is just as important and relevant to us and obviously to others, as any gourmand's dreams of excess. Perhaps, I dare say, more important, because this is how we live. This is real life. This is us. If Wells doesn't like it--so what? He doesn't have to read it. Me--I would like some beans and rice, please. why bother about these kind of review articles? The whole purpose of blogging is to write about whatever one is passionate about, or whatever pleases the writers mind. It is upon the reader to decide what to read or not. That was a disgusting article by that guy..I could not read beyond blood tongue at 8 am with my frenc-press coffee and donuts. Over the 'Deep-end'dining' cooked by an unseen chef, and its blogs, I would prefer the simple sambar-bhaat, sol-kadhi, misal and shevyachi kheer from 'someone's' hand any day!! It's just one of those journalists cooking up (bad pun..apologies)a holier-than-thou attitude. That aside, you are one of the few people who take the time to spread the flavour. Its about time Indian food has it's own place in the Sun. Your blog gives a picture of Indian food beyond chicken masala. Keep up the fantastic effort and ignore the haters!